Objective: The so-called granules for prescription have been developed about 20 years ago as a new form of modernizing and simplification of the classical decoction common in Traditional Chinese Medicine (TCM) practice. Due to actual problems in Germany/Europe, which are caused by the lack of quality monographs and judicial classification of granules for prescription, the aim of the study was a comparison of the chemical composition of commercial granules versus decoctions. Taking an example, decoctions, commercial granules, and organic extracts of two well-established TCM herbal drugs, Scrophulariae Radix and Xanthii Fructus, were examined in their specific composition. Methods: Using high-performance thin-layer chromatography (HPTLC) for fingerprint analysis of different batches of herbal drugs and samples from various suppliers of Xanthii Fructus and Scrophulariae Radix were critically examined. The decoctions were prepared according to traditional rules, while the granules were dissolved in water in accordance with actual regulations. Furthermore, organic extracts of the plant material were examined and compared with aqueous extracts. Results: It could be demonstrated, that in some cases, there are remarkable differences in the specific composition between granules from different suppliers, the classical aqueous decoction and the organic extract used for the HPTLC fingerprinting. On the other hand, few examples exist for good comparability of decoctions and commercial granules. Conclusion: After critical evaluation of the above results, it can be questioned, if there is a so-called phytoequivalence between decoctions and commercial granules for prescription used in TCM practice. The practice and use of Traditional Chinese Medicine (TCM) is not only popular in China but also in many European countries and mainly, in Germany. In 2010, the share in total export value from China to Europe was 15.8% and to Germany 3.48%. According to the impressive number of more than 1.5 billion patients worldwide trusting the efficacy and safety of TCM, it is important to critically examine these expectations. Besides decocting, the earliest and most popular methods of preparing herbal medicines, also different formulations, such as pills, herbal drug powder, oral liquids, and granules, are commercially available. Decoctions are often unpleasant herbal drug preparations for the patient, besides a considerable time for preparation, practical problems such as transportation and storage complicate the handling of decoctions. Furthermore, ensuring quality control  and stability of the aqueous preparations are additional disadvantages. To avoid these problems and to increase compliance of the patient, different formulations of herbal drug extracts have been developed. Especially, granules for prescription provide some advantages. They are easy to handle because they anticipate the extensive process of decoction while being easily dissolved in water and ready for use; consequently, a better compliance is achieved. However, there is little information available concerning the composition and exact preparation of these industrial formulations. Therefore, it is questionable, if generally granules can be used as a substitute for decoctions. Earlier dates showed that different formulations of one herbal drug, such as decoction, pill, and dispensing granule can possess a different quantitative and qualitative high-performance liquid chromatography (HPLC) fingerprint chromatogram. In addition, a legal problem complicates the use of granules for prescription in German pharmacies. According to the Ordinance on the Operation of Pharmacies (Apothekenbetriebsordnung-ApBetrO) § 11, for preparation of pharmaceuticals, exclusively primary substances with proven quality are allowed to be used. In the case of acquired primary substances with an appropriate test certificate, the identity of the compounds must be proven. Due to the lack of quality monographs and knowledge concerning the exact preparation of the granules for prescription, unambiguous identification of the preparations is not possible for the moment. On the background of this situation, the Bavarian Health and Food Safety Authority has sent a statement to the Bavarian State Ministry of Public Health and Care Services with the consequence that the use of TCM granules as primary substances in German pharmacies is not in conformity with the law. In this context, concerning the comparability of phytopharmaceuticals, the term phytoequivalence is often used. Following the definition of Uehleke et al., a preparation is phytoequivalent to other phytopharmaceuticals, if the individual effectiveness-determining substances are present in approximately equal amounts in both preparations and if the accompanying substances, which might influence the resorption, are present in a comparable quantity as well. According to Tyler, the current methodology is to prepare an extract, identify its activity following pharmacological and clinical studies to obtain approved phytopharmaceuticals and then establish a qualitative (fingerprint) and quantitative profile using different analytical methods. Other extracts with the same/similar chemical profile are claimed to have identical physiological activities and thus should be phytoequivalent. In this paper, two different TCM herbal drugs, Xanthii Fructus and Scrophulariae Radix, which are under preparation to be implemented in the German Pharmacopoeia (DAB), were chosen and analytically examined, using high-performance thin-layer chromatography (HPTLC) analysis. The intention was, to compare the HPTLC fingerprints of different organic extracts with decoctions and granules to obtain basic data concerning a possible phytoequivalence and also to resolve the problems of quality control of herbal medicines for the utilization of specific herbal drug monographs for the German Pharmacopoeia (DAB). Samples of Xanthii Fructus (prepared/roasted herbal drug material) and granules were purchased from different suppliers (herbal material: Herbasinica (origin according to supplier: Jilin), Chinamedica (origin according to supplier: Anhui); granules: Herbasinica, Herbanatura, and Chinamedica). Moreover, samples of Scrophulariae Radix (herbal drug material) originating from China were purchased from different commercial suppliers (Arobemed, origin according to supplier: Hubei; Sinophyto). In addition, samples of Scrophulariae Radix granules were obtained (Herbasinica, Plantasia). Analytical grade dichloromethane, ethanol (≥99.8%), n-butanol, glacial acetic acid, and p-anisaldehyde were obtained from Sigma-Aldrich (Steinheim, Germany). Analytical grade methanol was purchased from VWR chemicals (Darmstadt, Germany). Analytical grade ethyl acetate was obtained from Fisher chemicals (Loughborough, UK). Analytical grade sulfuric acid (95%–97%) was purchased from Merck (Darmstadt). Water used for decoctions was tap water. Ultrapure water for HPTLC analysis was produced using an Astacus LS device (MembraPure, Berlin, Germany). HPTLC was carried out on 20 cm × 10 cm silica gel 60 F254 plates from Merck (Darmstadt, Germany). Four reference compounds (harpagide, purity 95%; harpagoside, purity 96%; chlorogenic acid, purity 96%; 1,5-dicaffeoylquinic acid, purity 97%) were purchased from PhytoLab (Vestenbergsgreuth, Germany). The reference marker carboxyatractyloside potassium salt (purity 99.7%) was purchased from Sigma-Aldrich (Schnelldorf, Germany). All standard solutions were prepared to obtain a solution containing 1 mg/mL. A Linomat 5 (CAMAG, Muttenz, Switzerland) was used to spray the references and extracts on the plate (8 mm bands, 10 mm from the lower edge of the plate) using O2 as spraying gas. Development was performed with a saturated twin through chamber (ADC2, CAMAG, Muttenz, Switzerland) using a saturated magnesium chloride solution (Merck) to adjust the chamber humidity. Mobile phases consist of ethylacetate:methanol:water (77:15:8, v/v/v); dichloromethane:ethanol:water (70:45:6.5, v/v/v) for the analysis of Scrophulariae Radix and n-butanol:glacial acetic acid:water (4:1:5, v/v/v, the upper layer was used) for the analysis of Xanthii Fructus. The plates were developed to a migration distance of 70 mm from the lower edge of the plate. After development, the plates were derivatized (dipping) with an anisaldehyde reagent (AA-reagent, containing 0.5 mL anisaldehyde, 10 mL glacial acetic acid, 85 mL methanol, and 5 mL sulfuric acid 95%–97%). After derivatization, the plates were put on a heating plate for 3 min (100°C–110°C). The plates were documented before derivatization at 254 nm, 366 nm, and after derivatization under white light with a Reprostar 3 (CAMAG). Win CATS 1.4.9.2001 software (CAMAG) was used to evaluate the data. Decoction (D) – 10 g of herbal drug material (whole fruit [F] and powdered fruit [P], sieved with mesh size 500 μm) were covered with water and macerated for 60 min at room temperature. In the following, the decoction was started with intense heat. After boiling up, the heat was reduced. Further extraction was performed for 20 min. The first extract was strained. Herbal drug material was covered again with a small amount of water and extracted under heating once again for 20 min. Both extracts were combined.! Decoction (D) – 10 g of herbal drug material (whole herbal drug [R] and powdered herbal drug material [P], sieved with mesh size 355 μm) were covered with water and macerated for 60 min at room temperature. In the following, the decoction was started with intense heat. After boiling up, the heat was reduced. Further extraction was performed for 20 min. The first extract was strained. Herbal drug material was covered again with a small amount of water and extracted with heat once again for 20 min. Both extracts were combined. To consider and evaluate the different chromatographic fingerprints, two medicinal herbal drugs used in TCM, Xanthii Fructus and Scrophulariae Radix, were examined by means of HPTLC analysis from the point of view of a possible phytoequivalence. [Figure 1] and [Figure 2] show HPTLC fingerprint chromatograms of several organic extracts (E), granules (G) and decoctions (D; DF and DP) of Xanthii Fructus. Furthermore, HPTLC fingerprint experiments of Scrophulariae Radix were performed. [Figure 3], [Figure 4], [Figure 5], [Figure 6] show extracts (E), granules (G), and decoctions (D) of above-mentioned herbal drug material, developed with two different mobile phases. Side effects, while consuming the herbal drug range from nausea, vomiting, and dizziness to toxic reactions with following symptoms: loss of consciousness, hepatic or renal failure, or respiratory arrest. Therefore, large doses of the herbal drug should be avoided and to decrease toxicity, Xanthii Fructus is generally heated by dry-fried before use. For a comparison of commercial granules for prescription versus decoctions, an HPTLC fingerprint experiment with different Xanthii Fructus samples was performed [Figure 1] and [Figure 2]. Tracks 1–3 are showing analytical markers, chlorogenic acid A RF0.41 (track 1), 1, 5-dicaffeoylquinic acid B RF0.74 (track 2), and carboxyatractyloside C RF0.27 (track 3). Furthermore, in tracks, 4–8 different organic extracts (E) of Xanthii Fructus herbal drug material (P) and granules (G) are shown. Tracks 4/5 represent organic extracts of plant material samples (EP) from different commercial suppliers whereas, in tracks 6–8 organic extracts of granules (EG) are present. The fingerprints of this extracts are similar, except the spot RF0.26 [Figure 2], marked by arrow], which is not visible in granules or a spot with RF0.53 [Figure 1], marked by arrow], which is not visible in organic extracts of herbal drug material. Furthermore, classical decoctions and granules dissolved in water were compared in tracks 9–15 [Figure 1] and [Figure 2]. In tracks 9 and 11, extracts of the ungrounded plant material are next to the powdered herbal drug in tracks 10 and 12. Tracks 13–15 visualize granules from different suppliers. There is an obvious difference in the fingerprint of the decoctions comparing the entire fruit versus the milled herbal drug. The dried fruit has a very hard texture. After grinding, the matrix is destroyed and components such as pericarp, testa, and cotyledons cells are exposed with the result that a higher amount of typical constituents can be extracted. Illustrated by boxes in [Figure 2], particularly, the zone RF0.26 [Figure 2] in track 10, which is not visible in the decoction of the entire fruit [Figure 2], track 9] and the zone RF0.34 [Figure 2] in track 12, which is not visible in the corresponding decoction of the raw material [Figure 2], track 11] illustrate these expectations. To compare decoctions and granules from the same herbal drug, which should show similar results in fingerprint analysis, the last three tracks (tracks 13–15) demonstrate an interesting outcome. The result is an inhomogeneous fingerprint, mainly in the intensity of the zones RF0.33 (purple zone, see arrow in track 14) and RF0.38 (yellow zone, see arrow in Track 14) [Figure 2]. Comparing directly decoctions and granules, illustrated by brackets, two samples of each pharmaceutical form from the same supplier are shown in track 11 (DF) with track 14 (G) and track 9 (DF) with track 13 (G). Especially, the differences in zone RF0.33 (purple zone) and RF0.38 (yellow zone) are obvious. The proof of phytoequivalence, when testing commercial granules versus classical decoctions of the herbal drug demonstrated that the examined samples showed no comparable results concerning the presence of the respective marker compounds in the case of Xanthii Fructus. As a second example, Scrophulariae Radix was chosen since the elaboration of a respective monograph for the German Pharmacopoeia is underway. Scrophulariae Radix, also known as ningpo figwort root, originating from Scrophularia ningpoensis Hemsl. (Scrophulariaceae), is a common medicinal herb widely used in China. Among others, it is used for the treatment of cough caused by consumptive disease, red eyes, sore throat, and diphtheria. Pharmacological studies and bioassays showed that figwort root shows various bioactivities, such as anti-inflammatory and cardioprotective effects., Chemical constituents are known to be iridoid glycosides, phenylpropanoid glycosides  as well as volatile components, such as palmitic and linoleic acid. According to the relevant literature, among the iridoid glycosides, there are harpagide [Figure 9] and harpagoside [Figure 10], phenylpropanoid glycosides are represented by, for example, ningposide A. In addition, cinnamic acid is one of the constitutents. In accordance with the Chinese Pharmacopoeia (ChP) 2010, the iridoid glycosides harpagide and harpagoside were used as reference markers. To compare commercial TCM granules versus decoctions, an HPTLC fingerprint experiment was performed [Figure 3] and [Figure 6]. The HPTLC plates were developed in two different mobile phases. On the one hand, ethyl acetate:methanol:water [77:15:8, v/v/v; [Figure 3] and [Figure 4] and on the other hand, dichloromethane:ethanol:water [70:45:6.5, v/v/v; [Figure 5] and [Figure 6]. Regarding [Figure 4] and [Figure 6], next to the marker harpagide D and harpagoside E in tracks 1 and 2, in tracks 3/4, the organic extracts (EP) of herbal drugs of Chinese origin are close to the organic extracts (EG) of two different granule samples (tracks 5/6). Obviously, the two markers, harpagide D [Figure 4] RF0.16, [Figure 6] RF0.26; see arrow] and harpagoside E [Figure 4] RF0.36, [Figure 6] RF0.56; see arrow] are present in all samples. The fingerprints are comparable, apart from zones [illustrated by boxes in [Figure 4] and [Figure 6] which show a small difference in intensity, like in [Figure 4], RF0.41–0.51, RF0.20–0.30, and RF0.00–0.14, or in [Figure 6] RF0.70, RF0.62, RF0.33–0.44, and RF0.00–0.20. Tracks 7/9 [Figure 3], [Figure 4], [Figure 5], [Figure 6] are presenting decoctions of raw herbal drug material, together with decoctions of the powdered herbal drug (tracks 8/10). There is, however, a small difference in intensity, due to the milling process resulting in a surface increase, whereby more constituents can be extracted. Finally, in tracks 11 and 12 [see brackets [Figure 3], [Figure 4], [Figure 5], [Figure 6], equivalent to decoctions, the granules are dissolved in water. The two analytical markers harpagide and harpagoside are both visible, additionally, the fingerprints are comparable to one of the decoctions of herbal drug material in tracks 7 and 9 [see brackets [Figure 3], [Figure 4], [Figure 5], [Figure 6], except from the intensity of zones such as RF0.34, RF0.45 [Figure 6], small arrows]. Both analytical markers, harpagide and harpagoside, are present in granules and decoctions. The fingerprints of the performed experiments are showing similar results. Thus, regarding the HPTLC analysis, a so-called phytoequivalence can be supposed in this case. However, it must be mentioned that decoctions and granules might not always be in an equivalent concentration. The performed experiments can only give an indication about a possible qualitative composition when herbal drug material decoctions versus granules are compared. Although the samples studied may not be representative of the whole marketplace where the herbal materials were purchased from and may not be large enough to assess the statistical significance, the study outcomes mostly point out actual problems and call for attention on the nondescribed quality and hence analytical problems using granules for prescription instead of decoctions. After critical evaluation of the above results, it can be questioned if there is a so-called phytoequivalence between decoctions and commercial granules for prescription used in TCM practice. With increasing importance of TCM in Europe, comparative analysis on granules versus raw herbal drugs decoctions and respective decoctions are performed. According to Zhou et al., there also exists a significant quantitative difference, concerning five-selected marker compounds, between raw herbal drug and granules in Notoginseng (Sanqi). Different aqueous extracts of raw herbal material and granules for prescription were extracted with methanol, and the content of five marker compounds were quantified by UPLC and thin-layer chromatography analysis. Samples of raw herbal drug material are containing a significantly higher amount of the examined marker compounds compared to granules concerning the selected samples of Notoginseng. Finally, TCM granules for prescription at the moment are unregulated products for pharmaceutical and medicinal use. No specific quality monographs for granules exist neither in the actual European Pharmacopoeia (Ph. Eur.) nor in the ChP. Nevertheless, it is absolutely necessary to establish such quality monographs, to follow and control the actual market situation in Europe. For financial support, the BfArM (Kurt-Georg-Kiesinger-Allee 3, 53175 Bonn, Germany) is gratefully acknowledged. Many thanks are due to J. Heilmann (University of Regensburg) for scientific support and helpful discussions. Huang Y, Li H, Peng D, Wang Y, Ren Q, Guo Y, et al. The production and exportation of artemisinin-derived drugs in China: Current status and existing challenges. Malar J 2016;15:365. Hosbach I, Neeb G, Hager S, Kirchhoff S, Kirschbaum B. In defence of traditional Chinese herbal medicine. Anaesthesia 2003;58:282-3. Luo H, Li Q, Flower A, Lewith G, Liu J. Comparison of effectiveness and safety between granules and decoction of Chinese herbal medicine: A systematic review of randomized clinical trials. J Ethnopharmacol 2012;140:555-67. Chen L, Wang Q, Liu J. Simultaneous analysis of nine active components in Gegen Qinlian preparations by high-performance liquid chromatography with diode array detection. J Sep Sci 2006;29:2203-10. Federal Ministry of Justice and Consumer Protection. Apothekenbetriebsordnung ApBetrO; 1987. Available form: https://www.gesetze-im-internet.de/apobetro_1987/BJNR005470987.html. [Last accessed on 2017 Feb 13]. Bavarian Health and Food Safety Authority. TCM – Stellungnahme des Bayerischen Landesamts für Gesundheit und Lebensmittelsicherheit (LGL) zur Verwendung von TCM-Granulaten in der Rezeptur – Bayerische Landesapothekerkammer; 2016. Available form: https://www.blak.de/d/items/tcm-stellungnahme-des-bayerischen-landesamts-fuer-gesundheit-und.html. [Last accessed on 2017 Feb 07]. Uehleke B, Frank B, Reinhard E. Bewertung und Vergleichbarkeit von Phytopharmaka - Evaluation and comparability of phytopharmaceuticals. Dtsch Apoth Ztg 1994;134:1772-4. Tyler VE. Phytomedicines: Back to the future. J Nat Prod 1999;62:1589-92. Wagner H, Bladt S, Zgainski EM. Drogenanalyse. Berlin, New York: Springer; 1983. Bensky D, Clavey S, Stöger E, Gamble A. Chinese Herbal Medicine: Materia Medica. 3rd ed. Seattle, Washington, DC. : Eastland Press Inc.; 2004. Han T, Li HL, Zhang QY, Han P, Zheng HC, Rahman K, et al. Bioactivity-guided fractionation for anti-inflammatory and analgesic properties and constituents of Xanthium strumarium L. Phytomedicine 2007;14:825-9. Han T, Li HL, Hu Y, Zhang QY, Huang BK, Zheng HC, et al. Phenolic acids in Fructus Xanthii and determination of contents of total phenolic acids in different species and populations of Xanthium in China. Zhong Xi Yi Jie He Xue Bao 2006;4:194-8. Wang Y, Han T, Xue LM, Han P, Zhang QY, Huang BK, et al. Hepatotoxicity of kaurene glycosides from Xanthium strumarium L. Fruits in mice. Pharmazie 2011;66:445-9. Cole RJ, Stuart BP, Lansden JA, Cox RH. Isolation and redefinition of the toxic agent from cocklebur (Xanthium strumarium). J Agric Food Chem 1980;28:1330-2. Pharmacopoeia of the People's Republic of China. 9th ed. Beijing: China Medical Science Press; 2010. Qian J, Hunkler D, Safayhi H, Rimpler H. New Iridoid-related constituents and the anti-inflammatory activity of Scrophularia ningpoensis. Planta Med 1991;57 Suppl 2:A 56. Zhu LJ, Hou YL, Shen XY, Pan XD, Zhang X, Yao XS, et al. Monoterpene pyridine alkaloids and phenolics from Scrophularia ningpoensis and their cardioprotective effect. Fitoterapia 2013;88:44-9. Hua J, Qi J, Yu BY. 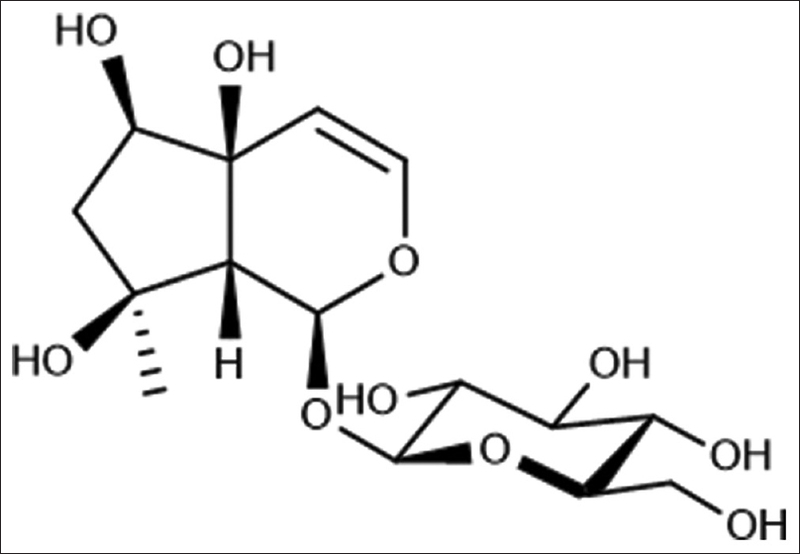 Iridoid and phenylpropanoid glycosides from Scrophularia ningpoensis hemsl. And their α-glucosidase inhibitory activities. Fitoterapia 2014;93:67-73. Miyazawa M, Okuno Y. Volatile components from the roots of Scrophularia ningpoensis Hemsl. Flavour Fragr J 2003;18:398-400. Kajimoto T, Hidaka M, Shoyama K, Nohara T. Iridoids from Scrophularia ningpoensis. Phytochemistry 1989;28:2701-4. Li YM, Jiang SH, Gao WY, Zhu DY. 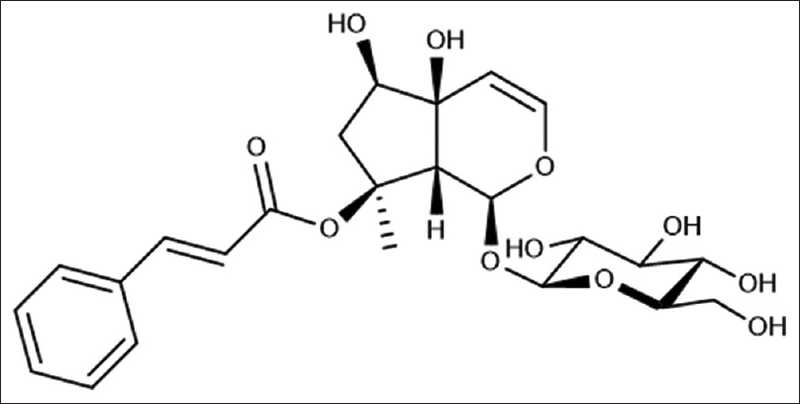 Phenylpropanoid glycosides from Scrophularia ningpoensis. Phytochemistry 2000;54:923-5. Miyazawa M, Okuno Y, Nakamura SI, Kameoka H. Suppression of SOS-inducing activity of chemical mutagens by cinnamic acid derivatives from Scrophulia ningpoensis in the Salmonella typhimurium TA1535/pSK1002 umu Test. J Agric Food Chem 1998;46:904-10. Zhou X, Razmovski-Naumovski V, Chan K. A multivariate analysis on the comparison of raw notoginseng (Sanqi) and its granule products by thin-layer chromatography and ultra-performance liquid chromatography. Chin Med 2015;10:13.